I'd like to share a few tips for parents with children on missions, especially regarding the final and sometimes difficult details of actually getting them safely home. We've sent four boys on LDS missions, and as I write, our youngest is with us in Shanghai, having survived the 40 hours of travel it took to get him from Piura, Peru to China. As with each of our other sons, I am impressed and delighted with what missionary service has done for him in terms of adding maturity, skills, and increased abilities to serve and succeed. It's a delight to hang out now, though not seeing him for two years (apart from Skype calls with a webcam on Mother's Day and Christmas) has been difficult. Sending him on his mission was difficult, too--so much paperwork, medical tests, clothing to buy, and then the emotions of sending a young man away for two years. But bringing him home is the difficulty that stands out in my mind the most. That's where I have a couple of simple tips, too. First, let me say I am extremely grateful to the Piura, Peru Mission and its kind leader, President Chad Rowley, and all those who make the mission possible, including a remarkably busy and helpful woman in Lima, Sister Campian, who fights untold battles to keep missionaries legally in the country, to manage their return travel, and to handle scores of details and bureaucratic burdens in a challenging place. It took a huge extra-mile effort from her and others to help my son navigate the complex and shifting requirements for getting a visa to China to see his parents. He came very close to not being able to come here but finally had his visa issued at the last minute. Whew. I also want to thank Elder Andrew Rainsdon of my son's mission for his kindness. My son was able to return home with a little over $40 in his pocket, largely due to the $40 Elder Rainsdon gave him as an unsolicited and surprising act of kindness when my son just mentioned that his card had expired and I was having difficulty with Western Union (difficulty as in several hours of wasted time with Western Union customer service). My son's bankcard expired before the end of his mission and my several attempts to use Western Union to get money to him all failed, in part because after two failed attempts, my third attempt, aimed at Atlanta, Georgia where he would be passing through, triggered a Western Union fraud alert I guess that blocked any attempt at money transfer by my or by my wife using two different cards, with no chance for appeal or repair, and no chance to move the money I had already spent in vain for Peru to Atlanta. Bringing each of our four boys home was difficult, partly because the details of their travel and travel dates are often not available as early as parents would like them. Mission departure dates often are affected by the schedules of incoming missionaries from the Provo MTC or regional missionary training centers, and may be affected by other events as well. Trying to schedule and organize companionships as missionaries come and go is complex. Tip #1: Have a power of attorney. The missionary should sign a witnessed properly notarized power of attorney form giving the parents or another appropriate person the legal power to handle things back home such as housing arrangements after the mission, school details, bank account matters, etc. Tip #2: Understand when bank cards will expire and know what will be needed to get new cards. This can be difficult in foreign countries. Some missionaries, such as my son, find their bank card has expired shortly before they return home, making it impossible for them to take money out of their bank. In some areas, it is difficult for foreign banks to get new cards mailed to the missionary. If a card is expiring, make sure the missionary takes out enough money for the trip home. Would have been nice in our case! Tip #3: Make copies of your passport and your birth certificate and leave these with your family or whoever will be making arrangements for you. Tip #4: Communicate clearly and early with your missionary about travel needs and hopes. Make sure you and your missionary understand the significance of deadlines and dates that may be important in scheduling the trip home. Make sure the missionary understands your hopes and expectations for time together before they travel off to school or some other place. Tip #5: If your missionary cannot provide useful information, and if you have not received advance information about return dates, go ahead and contact the mission home to inquire. Tip #6: Be patient and flexible in working with the mission home, but do expect answers and guidance in advance. Tip #7: If you live in somewhere requiring a visa in addition to your child's passport and want your missionary to go there after the mission, contact the mission home early and explain the process. For China, it involves turning a passport in to a Chinese consulate (the only one in Peru was outside my son's mission--challenging!) and then managing a myriad of details. Be available to rapidly provide information that is needed (this included a letter of invitation, our bank account information [carefully done to avoid fraud risks], and more details). Tip #8: Understand options for getting money to your missionary when things go wrong. My experience with Western Union was a disappointment. If you must use Western Union, understand that the information they provide you on how to pick up money may be incorrect. In our case, we learned that a photo ID alone was insufficient. Had they told us that Peru would require our son to have his passport, we could have made other arrangements, but his visa at the time was in the hands of the Chinese embassy in Lima. Sigh. Tip #9: Make sure you missionary has an international calling card for the flight home with some cash for the trip. Tip #10: Be grateful for each bit of help and each small miracle along the way, and be grateful for the privilege of having a missionary son or daughter. Don't let the big blessings be ruined by small inconveniences and hassles. There's a group in Shanghai called the Shanghai Mamas. These are expat (foreign) women from all over the world living in Shanghai, organizing together to help each other and do good. To me, it looks a lot like the LDS Relief Society. Anyway, these women are really awesome. They banded together to help a New Zealand woman who, while traveling from Europe to New Zealand while 6 months pregnant, went into labor during her brief layover in Shanghai. It has been a remarkably difficult and painful journey for this woman and her husband since their premature baby is now stuck in China and getting everyone home to New Zealand will be difficult and expensive. The story made headlines in New Zealand. One of the actions the Shanghai Mamas took to help this woman, Amy, was finding a place where she could stay that was closer to the hospital where the baby was. One of the Shanghai Mamas, an LDS woman, let us know about the situation, and we were able to let Amy move into our apartment the same day I headed to the States for summer vacation. She stayed another week with us after we got back, and we got to also meet her husband. Having them around was value added for us--such enjoyable people in spite of having to brave difficult circumstances. The Shanghai Mamas stopped in several times while we were here to bring meals and comfort for Amy. What kindness! And for a complete stranger. I love how these moms naturally organized and went out of their way to help a fellow mom in need. A wonderful example for people of all faiths. So glad we could be involved, also thanks to the Shanghai Mamas. She's now with other friends to give us more room for when our son comes home from his mission this week, though she didn't need to move out and we didn't expect her to. Just very gracious and considerate people. Please keep Amy and her family in your prayers. We need some small miracles to get her insurance company (travel insurance) to fulfill their obligations, and we need some miracles to get the baby safely back to New Zealand without family being on the hook for a $200,000 evacuation bill. Next time you travel when you are 6 months pregnant or so, make sure you consider these rare but not impossible circumstances. Having a baby in a foreign country and facing incredible red tape and bureaucracy from abroad and from home can put a dent in one's vacation. Sometimes we create our own barriers to spiritual experiences. Many people, including some Latter-day Saints, struggle with the notion that God would or could answer individual prayers, especially those dealing with seemingly trivial topics like a lost object or getting food when we are hungry. Influential circles of intellectuals spread waves of mockery when someone dares to share an experience involving a small blessing in which they felt that God helped them find food or car keys or some other thing they needed, for such alleged miracles are insulting to the collective intelligence of the Wise and Cynical Ones. These Wise and Cynical Ones (WaCOs for short) focus on the Big Problems of the world, all the suffering, war, hunger, climate change, and poverty, and find their collective intelligence insulted to think that God would ignore their list of global issues to reach down and help some Christian widow find her cat or help a hungry Mormon find a quarter to buy some chicken. How can God answer these petty personal prayers and provide trivial miracles when there are gaping global needs still unmet? The appeal to cynicism is draped in robes of justice: How can a just God ignore the big problems and provide little miracles to some random individual? A recent classic example of this involves the story from Elder J. Devn Cornish in which he shared how the Lord helped him at a hungry time in his life to find a quarter in order to buy some chicken. Howling and mockery were the result among the WaCOs. Elder Cornish, contrary to the accusations of the cynical, is a genuine intellectual acquainted with the realities of life and death. He is one of the world's great innovators in rescuing premature infants, and has dealt with the life and death struggles of these precious beings and the tears of their families for decades. He is as nuanced in the brutal realities of life as anyone I know. He was my bishop when I lived in Atlanta, where I served first as a Young Men's president and then a first counselor in the bishopric with him. He is one of the most inspiring and intellectual men I know. I think the mocking of the antis and of some of the Saints regarding his story of the chicken is just pathetic. It's a story that can teach us much. Nothing to be ashamed of. May we all have the faith and the humility to recognize the willingness of the Lord to help us even in the small things, and to recognize His hand and thank Him for those blessings, even when they are as small and simple as giving us this day our daily bread, or chicken. The skeptical attitude that mocks or at least reflexively questions specific minor miracles like the one reported by Elder Cornish seems reasonable, but its effect maybe to cast a critical light at personal prayer, to trivialize it, and ultimately to teach a man "that he must not pray" (2 Nephi 32:8), a teaching which the Book of Mormon identifies as one of the Adversary's main doctrines. The Lord, on the other hand, implores us to turn to Him daily and to cry unto Him not just about the Big Things like war and world peace, but also over the small things in our lives. The Lord's prayer teaches us to make our daily, personal needs part of our prayers: "Give us this day our daily bread," That helps us recognize that we are dependent on God and His blessings, even His miracles, for our sustenance. Do we recognize what a miracle and blessing a good slice of bread is? Are we grateful for this and see it as a blessing from Him, even when we appear to have earned the money that purchased it? It is in such small things that some of the clearest miracles occur, where we encounter the tender and personal mercies of the Lord. We must not let the existence of big problems crush our faith in the Lord and in His willingness to guide us in small things. Do not give in to the mocking attitude of the WaCOs out there. Let us see the hand of the Lord in all things and be grateful for each blessing, even the small trivial things that He may choose to help us with if we will let Him. Yes, there is suffering, and we need to do more to abate it. We need to be more prayerful for those in need, more generous, more proactive, more loving, etc., and that is clearly God's will. But do not let all those unmet needs out there cause us to abandon faith in God, or in our ability to make a difference with His help. Nor should we let it stop us from asking for help each day in our lives, and having a heart full of gratitude for the small helps and even small miracles we may encounter. I apologize for once quipping that the "Chicken Soup" book, Chicken Soup for the Lawyer's Soul, was pulled from the press once the publisher realized that lawyers actually don't have souls. Fortunately, quite a few lawyers do have souls. Evidence includes a short article in the July 2013 Ensign, "With God, Nothing Shall Be impossible" (link is to the PDF version; there is also an HTML version). 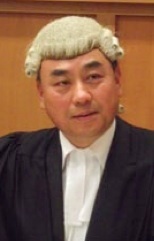 This is the story of Sang-Ick Han, a South Korean man who emigrated to New Zealand and, in an effort to better assist other Koreans in New Zealand, decided to go to law school at age 53. Though he had excellent English and had translated General Conference sessions into Korean, he found that the language of law was completely foreign (something that many of us native English speakers can affirm). He found the academic challenge of studying law at his age in a foreign language from intense teachers with strange accents to be much more difficult than he expected, and he quickly realized that it would be impossible to succeed on his own. Only with God's help would he have any chance. He succeeded, and is now a solicitor and barrister at the High Court in New Zealand. His story is notable not just for the faith he demonstrated, but also for the cool wig that he now gets to wear. One of his examples of how help came illustrate an important principle: do all we can, but put God first. Many people excuse themselves from service or even attending Church when they are under high pressure in their studies or their work. But making God a second priority can sometimes result in missing the little miracles that God often provides when we seek His help in faith. One day I was struggling to complete an assignment. I did my best, but I could not figure out what the lecturer wanted us to do. When Sunday came, I put off all study to focus on my Church assignments. As a stake high councilor, I visited an assigned ward to give a sacrament meeting talk. After the meeting a brother approached me and said that he had seen me in the classroom. I didn’t know he was a law student as well. When he asked me how the assignment was going, I told him honestly that I was having difficulty. He then offered to come over to my place to help me. If I had not gone to that ward and met him, I could not have submitted the assignment on time. He was an angel whom God had sent to answer my prayer. Faith of this kind results in miracles, though they may be small. There is no guarantee we will succeed in our ventures or that God's blessings will clearly and quickly compensate for the sacrifices we make, but I love how often the Lord gives us surprise help when we are trying our best and also striving to do what's right, even when it means sacrificing study time or work time to serve others or keep the Sabbath holy. I experienced a small miracle of this nature in my Ph.D. program. At one time, I needed every spare moment to crunch through a lot of data and prepare a paper for an international conference in Portugal that had to be submitted soon, so the request from my ward to serve in the Temple for a morning was not on my list of welcome diversions, but there was a need for my participation and felt that I should go. While in the Temple, during a quiet moment, my mind turned to the primary equation in my paper that I had been using in analyzing my data, and suddenly I could see that there was an error in it. It was a subtle but serious error that other experts at the conference might have noticed immediately when I gave my presentation. Yikes! I rushed home after the temple service and barely had time over the next few days to revise everything and submit my corrected paper on time. Whew! The conference went well and I was spared from a gruesome disaster, thanks to an unexpected blessing that came while sacrificing my time for some Church service. Things that might be impossible for us to do can be achieved sometimes with the help of God. I suggest we make Him part of our plans and our daily life in order to do more good and realize inspired goals. May we seek His help and guidance each day. On Thursday while visiting family in Utah, my wife and I went to the Mount Timpanogos Temple in American Fork and saw the recently released new movie that is used in portions of the LDS temple ceremony (the "Endowment" ceremony). The new movie follows the same script as before, as far as I know, but goes a bit slower. I understand this was done to make it easier for foreign language translations to keep up since more words are sometimes required to properly translate all the terms. The new movie has real acting, and I thought fairly good acting. What I liked best about the movie is Eve. She is much more of a real woman and, in fact, a thinker and a leader. She and Adam are a real couple. This was an Eve that I really like. Yes, I know people will still complain about all sorts of things, but I found this version of the Endowment a significant step forward. And the music was terrific. Plus the creation scenes were more beautiful (Hubble photographs?) and the film seemed to be high definition, which I really liked. Loved the rich textures in some of the garden scenes. Great photography, great music, and pretty good acting. Nice. LDSFAQ on the Mormon Temple and Masonry: Is the LDS Temple A Restoration of Ancient Concepts or Just the Result of Modern Plagiarism? Great news! Yesterday a new edition of the Journal of the Book of Mormon and Other Restoration Scripture became available online at the Maxwell Institute. You can download the entire journal as a PDF file, or any of the individual articles can be downloaded as PDF files. They are also available as text only. Here are the articles with links to the HTML pages, each of which then has a link to PDF version of the article. According to Edward Greenstein and David Marcus, "The story of Idrimi is unlike Mesopotamian literature both in content and style. "31 The story, as Oppenheim describes it, is "without parallel in texts of this type from Mesopotamia and Egypt. "32 This led him to conclude that "all this seems to me to bespeak the existence of a specific literary tradition, totally different in temper and scope from that of the ancient Near East. "33 Thus Oppenheim considered the autobiography of Idrimi to be unusual even for the ancient Near East. But the Book of Abraham belongs to the same specific literary tradition as Idrimi's autobiography. More inscriptions like Idrimi's from Syria dating to the Middle Bronze Age would enable a better comparison, but it is at least worth asking, How did Joseph Smith manage to publish in the Book of Abraham a story that closely matched a Middle-Bronze-Age Syrian autobiography that would not be discovered for nearly a hundred years? While some folks continue to make the tragic mistake of loosing faith over attacks based on the Book of Abraham, the evidence continues to mount for the authenticity of the Book of Abraham as an ancient text beyond anything Joseph could have fabricated. The evidence from the text of Idrimi is a minor part of that, but a fascinating one. One of the best treatments of other evidences for the Book of Abraham is the DVD, "A Most Remarkable Book: Evidence for the Divine Authenticity of the Book of Abraham." Also see Evidence for the Book of Abraham from Ancient Texts. Yes, there are still many questions and some things on the facsimiles that just seem wrong, like identifying a servant on Facs. 3 as Shulem when that is clearly not what the characters on that figure say. But there are so many strange and surprising elements that make sense or even appear to be "bulls eyes" that we cannot blindly disregard. I received an email this morning giving the exciting news of horse bones being found in Carlsbad, California that predate the arrival of Spaniards in the area. Could the horses be evidence of pockets of ancient American horses that were on the continent before the Spaniards arrived? That's a topic of interest in Book of Mormon studies. Just part of a random Nephite herd ;)? Or were they from an earlier unrecorded Spanish incursion into California or otherwise resulting from European sources? I don't know, but I'm disappointed that the story in the email was dated August 6, 2013, when that's just the email date. The email also fails to give the source of the story. The actual story is from 2005, making it old news. See "Centuries-old bones of horses unearthed in Carlsbad." It is interesting, but I would be more interested in knowing what has been learned since this tantalizing outlier was found and whether and of the initial guesses and radiocarbon dating still hold up. Any of you have follow-up information? My searching on the topic was unproductive and time is short today. Blair Hodges provided some notes from the recent FAIR Conference held in Provo (transcripts to be available soon). On day two of this conference, there were several speakers who had left the Church in the past over intellectual issues (objections to policies and actions, Church history problems, etc. ), yet found their way back. Their honest and intriguing perspectives can give hope to many who doubt and many who have left or on the verge of leaving. It is good to see that there is room for doubt and even disagreement on some issues without having to abandon that which is good and divine in the Church. Their journey and their growth in understanding can be an example of many of us. I think I especially appreciated the comments of Maxine Hanks. Stay tuned for more.